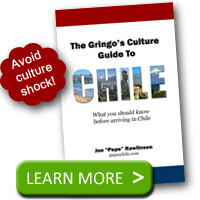 Chileans love to eat sandwiches, frequently called sánguches. These aren’t small sandwich bites or plain, boring peanut butter and jelly sandwiches. 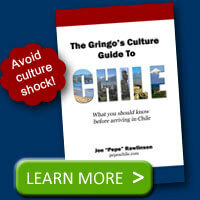 Chilean sandwiches have history, character, personality, flavor, and can be so big you need a fork to eat them. There are various restaurants, cafes, or “soda fountains” (fuentes de soda) that specialize in favorite Chilean sandwiches. 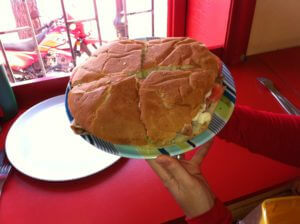 At Donde el Guaton, for example, you can get a massive sandwich that fills an entire plate. Chacarero – typically a thinly sliced beef sandwich usually topped with green beans (porotos verdes) in addition to tomatoes and chili pepper. I’ve also seen this sandwich with chicken or pork. You may also get to choose the type of bread for your sandwich. Typical choices include frica (a round roll), molde (from a loaf baked in a pan), or marraqueta (kind of like French bread). I’d recommend you try the frica bread. Building on the basic sandwich, you can get a variety of toppings to customize your sandwich. For example, you can ask for a sandwich clásico, completo, or italiano, all with different ingredients. Completo – “complete” will include everything but may vary based on location. Be prepared for tomato, avocado, mayo, sauerkraut, and more. Italiano – sandwich topped with avocado, tomato, and mayo. Whatever you get, it will be tasty. Enjoy! Have you had a Chilean sandwich? What is your favorite?